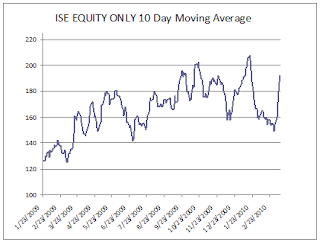 Below is a graph of the ISE Equity Only 10 day moving average. The high in January was 207. If the ISE equity closes at 240, where it stands as of when I am writing this post, the 10 day moving average will be 202 and another indicator will be in top territory. Below is a look at the raw data that makes up this indicator. Taking a closer look at the raw data, we will be dropping a very low number today, which I highlighted in red. For the three days following we will be dropping medium readings, which I highlighted in orange, so its not impossible that the indicator will continue to rise through the end of the week. To summarize, if we get continued call buying through the end of the day another indicator will be in the danger zone. However, it is possible for this indicator to continue higher through the end of the week which jibes with a top at options expiration. I use the site for intraday info, so I have that. Where do you get the historical data you show here? Is that subscription service data? I couldn't find it on the site. and click on the link "Download all available ISEE Historical Data"
Oh, duh! I was staring right past the download historical data link. I'm quite embarrassed. Woo hoo! Nice FOMC spasm and spike. Short time? Fading off the spike it looks like so far. Ah yes, there we go now. That looks like an exhaustion move, no? The call buying continued and the market reversed anyway. Thats a positive. I'm sorry, but I may not be clear on what you just said. By positive do you mean for taking a short position, as you had planned? Or positive for the market, which I don't quite understand, if so. A positive for you, not the market. I was too slow waiting for the put/call ratios to come out and the market already reversed. I took another short position on the spike. We'll see if this gets follow through. Time will tell, of course. Geez, looks like you're not regretting missing that. I stopped out of that position about even. You've sure been spot on with your calls the last few days (at least). Im still debating whether to put a small short on at the close. I am going to save most of my firepower for expiration. I'm sorry, stupid question (i.e. thoughts?). You've given them already. This may just take a bit longer with OPEX and all.